[Observers] tend to think of Europe’s current crisis as the result of overspending welfare states. And these states would indeed be better off with lower spending levels and less regulated labor markets. But many of the nations swept up in the euro-zone crisis, such as Spain and France, had spending and tax revenues well aligned before it hit. The true problem has again been monetary. Europe has for a decade had a monetary policy well suited to the circumstances of Germany but not to those of the rest of the euro zone and especially its periphery. Nominal income in Germany has stayed on a fairly steady trend line. In the periphery, however, it first went way up and then crashed. For the euro zone as a whole, nominal spending has fallen far below its previous trend—and has been continuing to fall farther away from it. Monetary policy therefore remains very tight in the euro zone overall. 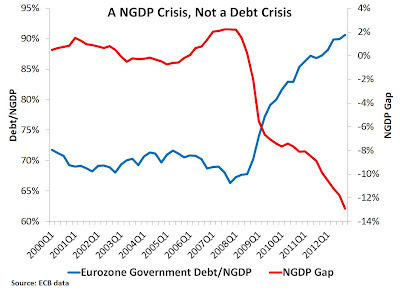 One effect of that drop-off, in Europe and in the U.S., has been to make debt burdens more onerous. I bring this up because today we learn just how bad conditions are becoming in the Eurozone: unemployment hit 12.1% in March, 2013! Michael Darda of MKM Partners observes that this is the highest unemployment rate in the Eurozone over the past few decades. And on a country-by-country basis the unemployment numbers are even more harrowing, as shown by Ryan Avent. What more will it take for the ECB to act more aggressively? Apparently, intense human suffering is not enough. Maybe the advent of Abenomics in Japan in conjunction with the Fed's ongoing QE3 program will spur the ECB into action out of fear of losing external competitiveness. How ironic it would be if Europe's periphery became the main beneficiary of Abenomics. Actually Michael Darda is understating things. The current unemployment rate of 12.1% is almost certainly the highest in aggregate for the 17 nations that comprise the eurozone since the Great Depression. Eurostat also has the estimated EA12 unemployment rate going back to January 1993. The EA12 and EA17 rates rarely differ much, if at all, since the only EA17 countries that the EA12 does not contain are Cyprus, Estonia, Malta, Slovakia and Slovenia, which together only have 3% of the eurozone's population. The EA12 unemployment rate reached a high of 10.9% in early 1997 and again in 1994. France, Italy, Austria and Finland each attained their highest unemployment rate during this period in 1994. West Germany had a higher rate in 1950-52 and again in 1983-85. The Netherlands had a higher rate in 1981-1990 and Belgium in 1981-87. A weighted average reveals that the unemployment rate for these seven countries was on average higher in 1994 than anytime else during 1950-94. The other five EA12 countries include Spain, Portugal, Greece, Ireland and Luxembourg. Eurostat has unemployment rates for Portugal, Ireland and Luxembourg going back to January 1983 and for Spain back to April 1986. The OECD has Spain's unemployment rate going back to January 1978. Spain easily has a larger population than the other four of these countries combined and its unemployment rate was higher in 1994 than anytime prior. Again an estimated weighted average suggests that the unemployment rate of these countries probably was higher in 1994 than in the decade preceding. Moreover as was true of the rest of the EA12, unemployment rates were probably rather low during the 1950s, 1960s and 1970s. A sovereign nation should never give up control of money printing press. What a mistake. Monetary policy is like prophylactics. One size does not fit all, even in Greece. Spain, Italy, Greece, Portugal should quit the ECB, print their own money and lots of it. Sheesh, there is 25 percent unemployment in Spain. And the ECB is talking about inflation? And how "democratic" can an institution like the ECB be? How does the Spanish citizen vote to register his dislike of the ECB? So, the most important macroeconomic policy-making tool is the central bank, but the public is essentially not at the table? This is good governance? With all due respect Prof. Beckworth, you're completely wrong and it's a little scary that you're teaching kids. "[Observers] tend to think of Europe’s current crisis as the result of overspending welfare states. And these states would indeed be better off with lower spending levels and less regulated labor markets. 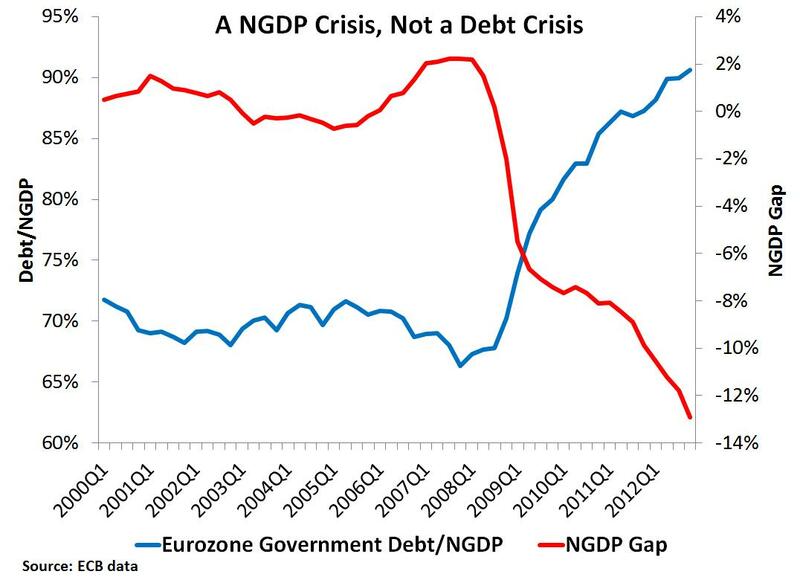 But many of the nations swept up in the euro-zone crisis, such as Spain and France, had spending and tax revenues well aligned before it hit." This is because they're was a credit bubble both in the private and public sectors that fueled economic growth (and thus tax revenues). To think that you are going to solve a fiscal/debt problem with monetary policy is ridiculous. When we tried to solve the dot.com bubble with lower rates we got the housing bubble, this time it's going to be much much worse. I doubt it. There was no "dot-com" bubble anyway. Low interest is a sign of innovation and productivity slowdown. The capital is already spent, there is no other bubble to build up. Either we risk a huge deflation and potential rerise of nationalism or we continue the current muddle through path. I know which one will be chosen. Monetary policy is pushing on a string anyway. Read Richard Koo (2009). Fiscal policy needed. QE for the people would work fine. The Eurozone unemployment rate of 12.1% cannot beat America's Obamacare issue. Majority of the small businesses would not want to have more than 49 employees. The health care cost is too much. I hope economic issues get solved by real economists and not by bureaucrats or inept and corrupt politicians. Dear anonymous, from the European periphery viewpoint I can tell you that there is a difference between and expansionary and a deflationary policy: in the former you will mantain your factories going and people working, while in the latter they are closed and lost forever. I may agree that the state can spend better in many cases but is it always spending in real economy which is private people's income.